This is the charismatic Jeannie Fletcher who is CEO of Yammé Wine Investments (and Head of Western Cape Association: National African Women’s Alliance), and she is one of South Africa's first black women to produce her own wine label. 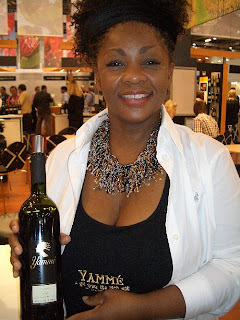 Her Yammé wines have a striking label image, based on Jeannie's own distinctive hair style, and a memorable name which means 'My Mother's' in the Setswana language. Jeannie told me that the name My Mother's refers to "the rich soils of Mother Africa that nuture the vineyards." There are an increasing number of wines using African names most of which I struggle to pronounce and recall, but I have no difficult with Yammé, or as I think of it -- Yummy! Because Yammé 2005 Pinotage is a yummy of a wine, being really appealing with a soft berry fruit front, sweet, yet not overly jammy body and a soft finish. It is a fresh and very drinkable wine which is sure to be popular with new wine drinkers, as well as those of us who want a reliable easy drinking quaffer. I think Yammé is a brand we will be seeing a lot of in the future. And I drink to its success! But are WINE now about to revive the competition? In the latest issue (May 07), it is noticeable that the magazine twice makes a point of stating that the competition was only 'suspended'. Editor Fiona McDonald, in an editorial entitled 'All is Forgiven', writes "I am excited by Pinotage nowadays - and I know my colleagues are too. In the past six weeks or so the most exciting wines I have tasted have been Pinotage or Pinotage-based in a variety of styles and from a range of producers. From young fresh and fruity wines, to serious wooded ones, fantastically refreshing Rose and also wonderful MCC sparkling wines which is 80% Pinotage." And Christian Eedes does an about turn when he writes that "Pinotage may still be South Africa's trump card." 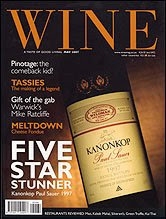 Kanonkop 2004 is given 4.5 stars in the tasting while 8 other Pinotages are awarded 4 stars. I have never heard of SAAM Mountain Heldersig, and they are not listed in Platter 2007 and a Google gets not a single hit, but it is interesting they have a Pinotage/Viognier. Fermenting Pinotage with a little white Viogner (the way the southern Rhone treats Syrah) was pioneered by Fairview. The International Wine Challenge (IWC) is the worlds largest wine competition. For the 2007 competition, whose results were announced at the London International Wine trade fair this week, 9,358 wines from 35 different countries were tasted by 400 judges, who included 33 Masters of Wine. Just 260 Gold medals were awarded (2.8% of total) and Groot Constantia 2005 was one of them and the only Pinotage with a Gold. I tasted it at the end of last year and wrote "There's a European feel to this wine, quite restrained with a good balance of red plum fruits and tannins and a very long finish. " 'The Best' Pinotage is the label used in Morrison's UK supermarket chain for Bellevue Estate's Sizanani Pinotage -- see here. Another 30 Pinotages gained Bronze and Commended awards, including one non-South African wine with a Bronze -- Fort Ross Pinotage 2003 from California. The Pinotage Association will be showing the ten winners from the latest ABSA Top Ten Pinotage Competition at the London International Wine and Spirits Fair from 22 - 24 May 2007. I am delighted that the Association have asked me to staff their stand and pour the wines. 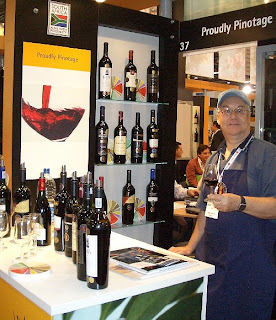 If you are attending the show, please do take the time to visit me at the Proudly Pinotage stall, which will be in the Wines of South Africa complex located in the centre of the hall at L40/L50. 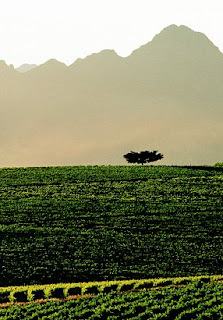 Uiterwyk Estate claim the world's oldest Pinotage vines are planted in their 'Top of the Hill' vineyard (pictured right), which is dramatically placed - as the name suggests - at the brow of a low hill crowned with a large solitary tree whose spreading branches provide welcome shade for farm workers during their lunch breaks. Because people like me can't pronounce Uiterwyk without making Afrikaaners wince, the Estate has been labelling their wines under the family name of DeWaal, and it is the three brothers DeWaal who make and market the wines. I popped into the tasting room with my good friend Keith Prothero where we were poured their three Pinotages. This comes from 25-35 year old vines on the estate plus some bought in fruits, and a third gets oak aging. This is their entry level pinno and sells for a reasonable 45 rand. On the palate it shows very soft fruit, it is very approachable with well integrated tannins and a fruit acid lift on the finish. 2004 DeWaal C T DeWaal Pinotage. This is dedicated to ancestor C T deWaal who was the first person to make a Pinotage wine. This has a dusky nose with some coffee tones and a bit of farmyard. It is dryer than the first wine, with tighter fruit, quite closed and feels it need some more time. 2002 DeWaal Top of the Hill Pinotage. DeWaals flagship, a multi-award winning label that is made only in exceptional years. The Top of the Hill vineyard was planted in the 1940's by Daniël de Waal Sr and these ancient bush vines produce small berries with thick skins and concentrated flavours. I found this wine a more older style Pinotage, with firm firm dry tannins, less approachable fruit, and crisp acidity (the wine was aged 21 months in all new 225l French oak barrels. If this reads like a less than enthusiastic review I'd like to add that the bottle was opened especially for us (many thanks - few can resist Keith's winning ways) immediately before tasting and I reckon it needs decanting and aeration to open up show its best. It's a serious wine, from a label I have greatly enjoyed in the past, and I'd like to pair this with a decent steak. So, off to Nando's to score a bottle of Stormhoek Pinotage for the cost of 2 glasses. Well, that was the idea. But despite an entrance display and the restaurant being covered in signs promoting their Wine Festival offer, the till rang up the full bottle price. Luckily I noticed the price momentarily flash up on the till and queried it and (after the managers special till authorisation card had been obtained) got a correction before paying. But I didn't notice they'd overcharged on the food, and with the general environment the evening wasn't the great success I'd hoped. The St Albans Blog recommends sitting upstairs, but staff headed off anyone making for the stairs and seated us crammed together on the ground floor until it was full. Various reasons were given, but basically it was for the convenience of the staff who presumably were tired of going up and down those stairs. The tills didn't always recognise combo's and charged each item separately, thus our order of chicken, chips & corn was charged as a combo (£8.10)while our order of chicken, chips and salad wasn't billed as a chicken/salad combo (£8.10)with a side of chips (£1.65) totalling £9.75 but as chicken (£5.45), salad (£3.45) & chips (£1.65) totalling £10.55. The chicken was tender, there was more peri-peri sauce on it than I've ever had it before, the chips were dull, like McCain oven chips, but there were plenty of them. The salad and its dressing were good, mixed lettuce leaves with three baby tomatoes and a couple of pepper strips. I think Nando's basic idea is brilliant. Flame grilled chicken (not deep fried like KFC) coated with a spicy sauce before cooking over real flames (not cooked elsewhere and microwaved like McD's) served with some simple accompanients, perfeck! My original Nando's experience was in Sandton, Johannesburg, the first time I went to South Africa in 1996. There was waitress service, great food, a choice of spicy sauces. It was really enjoyable and I thought then that this was an idea that would succeed. And if I was any sort of a businessman (which I am not) I'd have taken a franchise immediately. Over the years in Johannesburg and the Cape I have eaten Nando's takeaways, and I was pleased when Nando's started to open in the UK and delighted when one appeared in Snorbens. So, what about the wine? The bottles were stacked on the counter by the kitchen, not ideal conditions, and thus the Pinotage was too warm. This was the 2006 vintage, not the award winning 2005, and -- maybe because of the conditions it was kept and served in -- it didn't taste quite as good, there was a sharp edge to it and a rim of small bubbles. We didn't hang around for a dessert (tempting though they sounded), but took the unfinished bottle home, where chiled a little it delivered some ripe blackberry fruits and - the little that was left -was very drinkable. 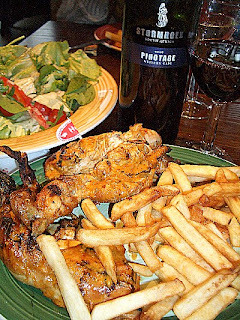 Conclusion -- Nando's is a place to eat, not to dine. Deetlefs Oak Matured Pinotage 2005 won a Gold Medal and the Top Pinotage Award at the 2007 Swiss International Air Lines Wine Awards, announced on 5 May. Stellenzicht Golden Triangle Pinotage 2005 was the other Gold Medal winning Pinotage. The Swiss International Air Lines Wine Awards competition focusses on exposing South African wines and winemakers to major local and international retail chains, with food and wine pairing being an important component of the judging criteria. President of the Swiss International Air Lines Wine Awards is Robert Joseph, founder of the UK International Wine Challenge. Judges include wine buyers from international retail chains and Swiss International Air Lines considers entries for serving on their flights. Congratulations to Deetlefs and Stellenzicht. For as long as I remember I have been telling anyone who would listen that Kanonkop’s Pinotages need bottle age. "Don't drink it before its 10 years old," I'd advise. There were exceptions. I remember the 1999 vintage was very accessible when young, and I think some recent vintages have also been youthfully delightful . But, as is fitting with its recognised status of a South African ‘First Growth’, they are wines that repay keeping. And uniquely Kanonkop wines feature a maturation graph on their back label, showing the progress from fermentation through bottling (shown in a warning grey block titled Bottle Shock) and gradually rising to an area marked Optimum Drinking. Anyone following the suggestion on the back of the 1995 vintage knew they should keep the bottle unopened for at least six years after purchase, since the optimum drinking period starts in 2002 and carries on past 2011. Monday was the May Day public holiday in England. For obvious reasons this is my favourite holiday, and we celebrated with roast chicken with all the trimmings and a bottle of 1995 Kanonkop Pinotage. I’d tasted the '95 Cape Winemakers Guild bottling at the winery in March and it was superb. But warning bells rang as I tried to remove the cork. The corkscrew just pulled out crumbling cork, two more attempts just removed more cork fragments, and the visible part of the cork I had managed to lift a fraction of an inch above the bottle was stained red with wine. I managed to remove the remains of the cork with a two pronged ‘butlers’ friend’ cork lifter. I have two bottles remaining of the 1995, and although I think the wine is on a plateau and will be drinking well for many years to come, I cannot trust the cork will keep the wines in that condition. 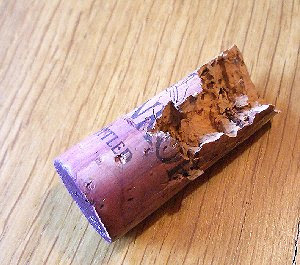 The cork’s elasticity is going – the red stains along its length show that. And oxidation occurs as the elasticity goes. The strongest argument against screw-caps (and one with which I have some sympathy) is that cork is proven for aging wines. Here we have a wine that will, can, and does age -- and 12 years isn’t long for wine -- and yet the cork isn’t up to it. Maybe this is a one-off poor cork, but I’m not risking it. I’m opening my 1995’s sooner than later, and you might consider doing the same. Shame, as I was intending keeping them a while for another special occasion. Note: the opener gained the name 'butlers' friend' because they allowed a dishonest servant to open and drink his employers best bottles, replacing them with cheaper wines and replace the cork without showing any mark on the cork. Buy two glasses of Stormhoek Pinotage, or any other wine, and get the rest of the bottle free. That is the offer in the current Nando’s Wine Festival which runs until 13 May in the UK. Nando’s flame-grilled chicken restaurants have spread fast throughout the UK, and since Nando’s originated in South Africa it is not surprising that some South African wines appear on their new wine list, and there are two wines each from Spier and Stormhoek. I wonder why, of all the wineries in South Africa, that it is the newcomer Stormhoek that gets on the list? Is their success solely a result of their blogging, as is often claimed? If blogging is a factor, how come the so few of Stormhoek’s competitors have blogs? And why do those who do have blogs update them so infrequently? Of the Pinotage producing wineries that I have found with official blogs (links on the right menu bar) Backsberg didn’t post once in April and Warwick haven’t posted since 9 March. Beats me. Anyway, back to Nando’s. They describe Stormhoek Pinotage as “Alluring – a very deep and sophisticated character with a complex nature”. A 250ml glass of sophistication costs £4.95 and the alluring bottle is £14.95. During the festival Nando’s are also holding wine tastings in the evening. South Africa's Sunday Times has been running a competition over the past months asking readers to write a tasting note for their favourite Pinotage; the prize is a presentation case of the ABSA Top 10 Competition winners donated by the Pinotage Association. This Sunday they announced that the winner was Lynne Maddock who wrote "I have been a Pinotage fan since returning to SA in 1986, after a 23-year absence. In Canada, it had only been Roodeberg, Roodeberg or Roodeberg. An unusual recent discovery was Diemersfontein’s 2005 Pinotage, which has quite an arresting coffee/chocolate nose. Forget blackberry, grass clippings, hint of boomslang bladder, whiffs of fig — wafting from this Pinotage is a deep fragrance so novel and rich, I wanted to breathe it forever. 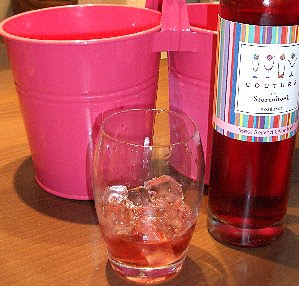 Following on, the wine itself was packed with fruit and full-bodied, intense at first sip, then mellowing. Savoured to the last drop and a new favourite." And Diemersfontein was chosen by so many entrants that the Sunday Times said "If Lady Di was the People’s Princess, then Diemersfontein is the People’s Pinotage. After a month of readers’ recommendations featuring this home-grown varietal, Diemersfontein was the overwhelming favourite." Congratulations to Lynne Maddock and Diemersfontein. The full article with all the tasting notes is here. And for the background on how Diemersfontein winemaker Francois Roode (pictured at top left) makes the People's Pinotage see There is no Secret.